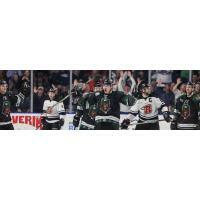 On Military Appreciation night, the question would be if the Utah Grizzlies would be able to break through the seemingly impenetrable fortress that was Rapid City Rush goaltender Adam Carlson. Having shut out the Grizzlies three times this season and allowing one goal on Thursday's contest, Carlson hardly appeared to be human. Having failed to take advantage of a five-on-three power play, facing a two goal deficit, and playing shorthanded, Utah's chances seemed to be fading. However, Mitch Maxwell, Mike Economos, and recent returnee Gabriel Verpaelst were undettered. The mighty Carlson showed that he was indeed human as all three Grizzlies lit up the scoreboard and what was a two goal deficit turned abruptly into a 3-2 lead. When the captain Teigan Zahn redirected a puck and Economos fired an empty netter, the Grizzlies were victorious in a 5-2 victory. "We talked about working hard and that's what we did tonight," Economos said. "It was nothing fancy. It was working hard and crashing the net. Carlson has been red hot against us so it was huge for us to get this win. The crowd was amazing. Anytime there was a hit, a fight, a goal it was electric and they gave us a huge spark." It all began when Maxwell fought for a puck, shuffled it from side to side and watched as it trickled past the red line for a Grizzlies goal, only their 9th in nine games against Carlson. That sparked a fire within the home team as Verpaelst's bullet from deep found the right crease of the net and Economos erupted from the penalty box and launched a nasty wrist shot to complete the flurry. "It was the right place at the right time," Economos said. "The boys were joking with me that I wasn't trying to go five hole and I wasn't but sometimes the bounces go your way and it happened to go in. In the first period, clearly frustrated by their lack of success against Carlson and the Rush, tempers flared and fisticuffs flew in abundance during a first period that was dominated by Rapid City. 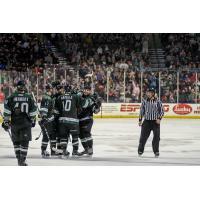 Once again, Cedric Montminy continued his torrid streak against Utah with his fourth goal in just three games. In all, Rapid City dominated the first period, outshooting the Grizzlies by a large margin, 19 to seven and most importantly, 2-0 with Tyler Poulson scoring Rapid City's other goal. But the remaining forty minutes belonged solely to the resurgent Grizzlies. The fact that the all four of Utah's goals came from secondary scoring threats is particularly encouraging as the Grizzlies are in the home stretch portion of the season. "We earned this one," head coach Tim Branham said. "In between the first and second periods we talked about enough was enough and we needed to outplay and outwork them and the boys came out and took control. Special teams were huge for us tonight and this series and tonight it worked in our favor. To get the secondary scoring is huge and come playoff time teams are going to be keying in on our main guys. Third lines win championships."